The Wheeling Alternative - Have Ogden "newspapers" picked a favorite in WV's Republican senatorial primary? 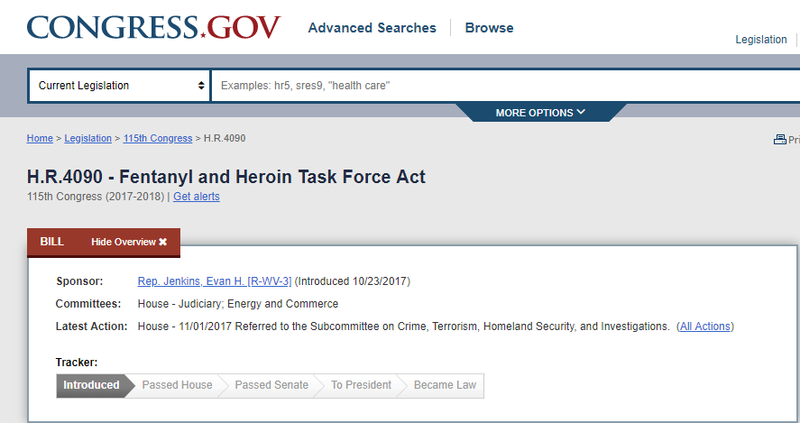 The supportive article describes Jenkins' sponsored drug legislation but tells us nothing about where those bills currently stand or their chances for success. Because any congressman can simply propose legislation, I decided to check on each bill to see what it's current status was. The first establishes a fentanyl task force to coordinate the efforts of federal agencies in their efforts to eliminate fentanyl from communities. This is House Bill 4090 and this is how Congress.gov reports its status. The bill was introduced almost five months ago and has gone nowhere.